Inventory We are a resale marketplace, not a box office or venue. Ticket prices may exceed face value. This site is not owned by Ohio Stadium . Ohio Stadium is one of the most recognizable venues in the country as home to the Ohio State Buckeyes for closing in on 100 years. Opening way back in 1922 the Ohio Stadium box office is located at 411 Woody Hayes Drive on the OSU campus in Columbus, Ohio. The field is commonly referred to as the Horseshoe or the Shoe. The current seating capacity is 104,944. 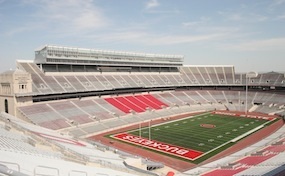 Ohio Stadium has been added to the National Register of Historic Places. Ohio Stadium tickets have included concerts for Pink Floyd, Billy Joel & Elton John, Kenny Chesney, One Direction and many more scheduled events. Ohio.StadiumColumbus.com is not currently affiliated with any primary box office, venue, and or website. We are an independently owned and operated company that concentrates exclusively in the online resale of all events in the secondary ticket market. Prices on our sites tend to be above face value but can change quickly with market conditions. To order tickets to all Ohio Stadium Columbus events simply follow the steps online through checkout or call our operators at anytime.